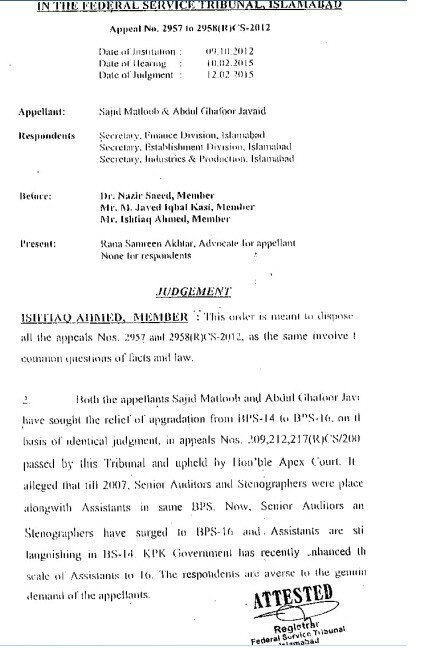 The Federal Service Tribunal Islamabad has issued its detailed decision on 12th February 2015 in connection with Upgradation of Assistant from BPS-14 to BPS-16. The FST has directed to decide the appeals of the applicants within a period of two months. The base of the decision is that Stenographers and Senior Auditors were in the same scale as the Assistants prior to the upgradation of Stenographers and Senior Auditors. The Stenographers and Senior Auditors have already been upgraded but the Assistants are still in BPS-14. 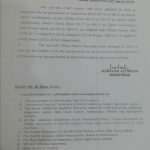 The Khyber Pakhtunkhwa has already upgraded the post of Assistant from BPS-14 to BPS-16. 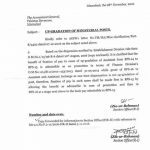 Decision on the case of Upgradation of Assistant from BPS-14 to BPS-16 has already been issued on 10th February 2015 by the FST in favour of the Assistants. The FST has already directed to the concerned that the same upgradation be done within 2 months. But after a lapse of three months period the Notification of Upgradation of Assistants has not been issued. Mr. Abdul Ghafoor and others have again appealed in the FST for the implementation of the decision of the FST. In this regard the Notices have been issued to the concerned. The recent hearing of the case of Upgradation of Assistants from BPS-14 to BPS-16 was 17th June 2015. With the consultation of Law Division, Finance Division submitted its report. The law division is in favour of the Upgradation of Assistants from BPS-14 to BPS-16. The summary of the same has been submitted to the PM for approval. Next date of hearing has been fixed on 17-07-2015. Pray for the best. 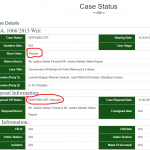 Next date of hearing of the case of Assistant from BPS-14 to BPS-16 is 31-08-2015. Pray for the best. 19-10-2015 is the next date of hearing of Assistants upgradation case. Next date of hearing has been fixed on 27-01-2016. Can i get any NEWS about up-gradation of Research Assistant BPS-10 and BPS-12 working under federal government departments, As some departments are allowing BPS-14 to research assistants working under federal as well as in provincial governments. Please update me also that whether Research assistants are included in Assistant that upgraded to BPS-14 or BPS-16? i apply for assistant (ext) ah BSP-16. what kind of job it is. plz tell me ..
Can anybody tell me possible details about job of assistant BPS-14 in naval headquarters. we have a problem here in UET Peshawar and other sister university that we are highly qualified MSC in the relevant field has no promotion and up gradation rule. they told that your case is up-gradation and has no promtion. pls let us guide that if any deciosn that show that up gradation and promotion be treated equal. AOA i hope u all are fine and well. dear friends i am woking as IT ASST(BPS-14) in combined Military Hospital. there are different rumors about upgradation of Assistant from 14 to 16. 1 : Sir why the notification letter are not dispatch to all departments??? . 2 : The Decision has been changed or unchanged about upgrdation?? 4: some people are saying that only HEAD-CLERKS and Assistant will be upgraded. NOT IT ASSISTANT...?? Kindly clarify each point please. your kind reply will be highly appreciated.. 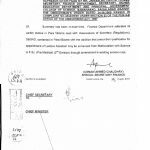 Copy Notification of Assistant in Fed.Govt.BS-14 to BS-16? 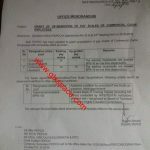 that was not notification only office memorandum addressed to Secretary Establishment Division. Please, can you tell me about the up gradation of Assistant, UDC, LDC`s announced in budget 2016-17 notification were issued or not. ????????????? Please tell me about up gradation of Cashier in federal government whether cashier posts will be up graded or not. Dear Talha still not confirm. Sir, kya stenotypist/graphers ki b upgradation ho gi? Q k Assistant pehly 11 my tha ab 14 my phr 16 my ho rha hy. Assistant ke up gradation Jo Punjab me bps.14 sey bps.16 me hoi hay us me 2010 ka 50% same rahy ga ya bps 16 ka new fix ho ga.
Mery Khyal se Upgradation wala muamla sust ho gya hy.... hen Na??? Mam, what about upgradation of Assistant BS- 14 to BS- 16 for Government of Sindh? meri appointment 22 october 2015 ko as an assistant bps 14 me federal department me hui hai, tou mujhy upgration k baad bps-15 millay ga ya bps-16 millay ga? please tell me the stage of pay in BS-16 at which I will be fixed. I was head Clerk BS-15 at 25th stage i.e Rs.33610/- on 01-01-2016 at time of up-gradation of clerical staff by Govt. of the Punjab. weather because of same pay stage in BS-16, I will be awarded an additional increment or not? Sir jin logon ne apply kia hua hai Assistant bps 14 ki job k liye wo jb select jon ge tu kya wo bho 16 scale me jaein ge??? Today i again confirmed from FST authorities as we are are in neighbourhood of FST. They confirmed that court has decided the case, detail decision is being write up now a days. Insha Allah Govt. will issue necessary orders as directed by FST. Yes, Usama all Ministerial caders of Federal Govt. will be upgraded accordingly. Post up-gradation means all existing and new entrants will be upgraded. Kindly confirm that people having 1 year or less experience will also be upgraded.bcz I am working as data base assistant as bps 14???? Can any one please tell me kaya army k civil employee b upgrade hon gy. I m I.T assistant in bps 14. Arslan bhai last date of hearing 27-01-16 the. aur court ny decision dy dia hy. Please post a copy of Court's decision, if any. Congratulations to all Federal Employees, FST has announced its decision and directed the concerned to immediately implement the up-gradation of Assistant as per analogy of Punjab, KPK. plez. share latest updates of clerical upgradation in federal on 13 jan. hearing. Any updates for today hearing, ya phir mamool k mutabik topi pehnain gy? dear mam please update the position of upgradation of assistant about hearing on 13-1-2016 in FST. As soon as i get the updates of the case of Assistant Upgradation I ll share. Please intimate what achievements are being made for the up-gradation of Head Clerks serving in Federal govt departments. Waiting. Dear Wakeel Ahmed still no updates. I am Working as a Store keeper in a university BPS-14 and have almost ten year service. According to recently up gradation of clerical staff we r also deserving but Govt is unable to pay attention and scale16, How we can file our case in court ? hi i am working as Senior Assistant BPS-15 in Election Commission of Pakistan is there any up gradation news for said scale????? Are you sure. On what grounds and lastest progress plez. Further where from you captured this topclass info. Up-Gradation of Assistant to BPS-16 will be made from the date of Judgement given by F.S.T from the date when first judgement was given. Ma'am I want to appreciate you for your valuable work and hope the same spirit in future I am Assistant in federal Govt. Employee and waiting for the notification of Up-gradation of Assistant. God Bless U more. madam kindly let me know whether any notification has been issue for up gradation of assistants or not.when it wil be issue as aps and stenos notifications have already been issue and get are enjoying fianancial benefits since a long time y not assistant r v step sons of govt it is purely 100% injustice with all assistants.all of us and finance div is to think about it. Dear fakharuddin still not issued. Ju Assistant equal to grade 13 hay keya wu be 16 me jain ge ? please tell me when in wapda /discos commercial assistant / audit assistant/ accounts assistant will upgraded in scale no.16 from scale no.14. Federal Service Tribunal has directed to Finance Division and Establishment Division vide Judgement No. 427 dated 04 May 2015 to take necessary/appropriate steps to finalize the matter by removing the disparity in the pay scale of LDC UDC which has occurred among the similar posts of different organization of the Federal Government of Pakistan. The constitution of Islamic Republic of Pakistan vide Article No. 25(1) read with the article 38 .The Govt of Pakistan may kindly be implemented the FST decision letter and spirit and upgrated the clerical posts like auditors with effect from 2005. Madem Shumaila i want to know some difficulties about para-26 of the summary approved by the P.M. dully endorsed by the Law. what is the proposal made at para-26? if available may please be share with us, I shall be very thankful to you. The above query is for the upgradation for the post of LDC,UDC and Assistant of the Federal Government. Dear mudassar hussain I am also searching para 26. As soon as i get the same i ll share here. It is submitted that Junior Auditors and Senior Auditors Of Federal Govt up gradated With back benefits in 2010 with effect from 2005 and now Prime Minister of Pakistan approved the summery of LDC UDC and Assistant with effect from 2016 while before 2007 Junior Auditor and LDC Assistant and Senior Auditor were same why the auditors upgraded with effect from 2005 and clerical posts withe effect from 2016 this discriminatory with the employees.We are requested to Federal Govt to that LDC UDC and Assistant may kindly be upgraded like auditor with effect from 2005. I want to bring you kind notice on the news published in the Rawalpindi Jang dated 22.11.2015 regarding "PM sign the summary of up-gradation of the posts of LDC/UDC and Assistant for BPS-11,14,16 respective. Kindly use their resources and confirm / authenticity of this news from concern Ministry. I shall remain thankful to you. PM has approved the summary regarding upgradation of ministerial posts i.e LDC, UDC & Assistants but sorry to say that it's a time scale upgradation. There will be no substantive benefit to the clerical staff bcoz it will be just like move over and the employees will get the next above stage in the upgraded scales. No premature increment will be awarded to them. There will be no increase in house rent, conveyance allowance, medical allowance, TA/DA, Rental Ceilings and other entitlements. They can not enjoy the entitlements of upgradaed scales as they will be originally in their previous scale. You can not expect anything positive in favor of govt employees from current govt. The court decision was to upgrade these posts as par like Accounts/Audit cadre but the current approval of PM is totally against the spirit of court decision as disparity between the cadre still prevails. I think that we will have to consult courts again to get upgradation. weather same decision is applicable for computer assistants working under ministry of Defense? can FST take any so moto action for the other categories of Federal govt servents as store side staff and supervisory staff who have no right to appeal in the court for upgradation. my personal view is that scales/grades may be granted adjusted on educational/technical qualification. its awful for a graduate worker to serve under matriculate clerk/supervisor. some one to think on this who may be answerable some day some where. Hi mam I am Munir memon from Larkana, I am working as Assistant BPS-14 in Zakat department. I want to know abut our upgradation in 16. Is it in movement /process? and where is our summary reached and when it will be announced? please give me updates thanks. Next date of hearing is 24 November. Madam up gradation k baray mein kia up dates hein please iss baray mein boht saray log iss web pe sawal kr chukey hein lekin ab tk koi information nahi hey na govt ki taraf se & na hi APCA ki taf se plz ap kay pass koi khabr ho tu share krain ya koi khabr nahi hy tu bhi plz batain. What about last hiring date for the upgradation of 14 to 16. Mubarak Ho AJK walon k liay, lakin hamari qismat kb jagain gy yaar??? Madam, any update about the today hearing of upgradation of assistant case??? Aoa when notification issued for upgradation of assistant Bs 14 to 16 in punjab govt n from which date it will implement? If you wants to wast your life you join Pakistan Air Force as a civilians employee. If you do not believe you join PAF than experience you I am right. I have come to know that HEC has announced that any private affiliated college and sub-campus of any university cannot offer the M.Phil programme, but it can be only in the Main campuses. I want to ask you have you got any information or notification of such sort. Dear Aamir Hanif I have also read the same news but not yet got the Notification of the same. Dear Mubasher ali let's wait for the Notification. mam wana know that any up gradation in process for computer in KPK. Dear atif still no updates. Dear Muhammad Asghar read the latest post at this website. I need copy of the Notification of the grant of pre-mature increment to the employees of the Punjab Government on their up-gradation issued by the FINANCE DEPARTMENT. Please provide the same at the earliest as i have to file a WRIT PETITION in the LHC for compliance of the same. Dear RAZA MUHAMMD Punjab Govt has not yet issued the same Notification. Any update after hearing 29-09-2015? Dear Masood Sandhu next date has been fixed as 19-10-2015. Dear Madam any updates about federal government assistant upgradation. Dear yargul still no latest updates as soon as i get the updates I ll share. Dear Syed Muhammad Ali as soon as i get the updates I ll share. Thanks for praying for me. Dear Ghulam Qadir, I ll soon check the same. Plz inform me when the up gradation of Office Assistants will b done from where it will b applicable i mean w.e.f..
Dear Mukhtar Ahmed there is no exact date of the same. Dear Abdul Rasheed, if the Govt mot implement on it then there may be other appeal. Respected Sister Shumaila, How can Federal Service Tribunal get implementation of its decision about Assistant. What is the power of FST? If the government refuses to implement then what will happen? Dear Sajid Mehmood you can try for the same alongwith the proofs of other upgradations of this post. Altaf Rehman sab I deem it wise to agree. Your question is absolutely right? contempt of court should not be only for common people. Great news. what are the proposed pay scales which have been concurred by Law Division? Whether it is grant of time scale or up gradation? And where is the summary now .. Please update if possible. thanks brother. agar apki news sahi ha to iska matlab k khushi ki news jald arhi ha inshaallah. wese ap finance division ma ho to ap se authenticated news to koi nai de skta. plz keep updating. thanks alot. Salam Muhtamim sahb.. sbi jo ap upgradation ki bat kr raha hy us UDC/LDC ki kia scale zer ghor hy? any information plz. Dear Iqbal In Sha Allah they will be upgraded soon. Madam there is any news about the up-gradation of Data Entry Operator(BPS-12) of federal as well as provinces employees? Madam,do you have any news about the up-gradation of Assistant in Sindh province?thanks. Dear junaid still no updates of the upgradation of Assistant in Sindh. 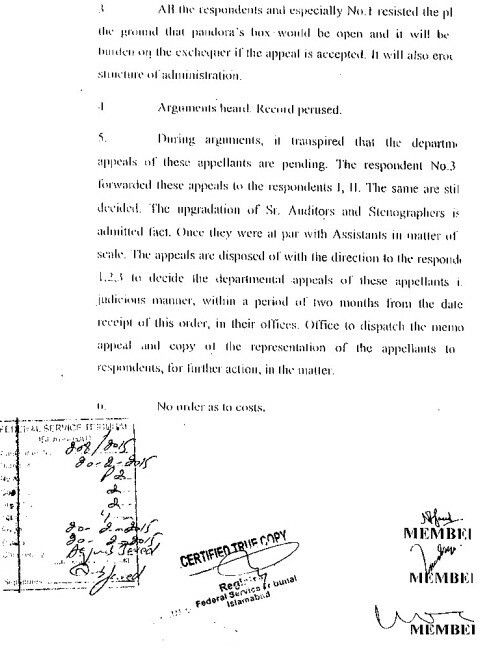 As per some sources "the summary of up-gradation of Assistant’s now reach in the Law Division”. After the approval of Secretary Establishment Division (also added LDC’s and UDC,s) the summary send to Prime Minister and Prime Minister send the case to Law Division FOR CONCURRENCE. Insha'Allah it will be done soon. Bhai ye govt wese itni achi to nai k chupke se hmai scale dede or charcha na kre. Matlab agar aisa hona hota to govt APCA or Doosri tanzeemo ko strikes na krne deti or unhe btaya jata k scale milenge apko is budget pr. Dear Ahsun Shah, may Finance Division may hi Assistant ho aor ye mujay Establishment Division say pta chla hai. aor apki baat bi tek hai k itni assaani say up-gradation nhi karingay lakin already kpk,baluchistan etc nay Assistant ki up-gradation ki hay. to ab ye mjbori say up-gradation karingay. Bilal, please visit Establishment Division`s website wherein clarification has been uploaded. It has been clarified that since pm assistance package 2014 has been held in abeyance, all cases may be decided in the light of Assistance Package 2006. Now, cases can be processed according to previous package. Thanks Muhtamim for updates. Efforts are appreciable. Any update regarding up gradation of Assistant? Dear Hajira Begum there is no exact date. I hope there are chances in the coming budget. Medam please is there any rule or notification about relaxation in age to a Federal government employee in ppsc. thanks. Dear malik zaheer I m not confirm but I have heard that there is so. Dear Malik according to my knowledge it should be. agreed I also confirmed from PPSc information officer. 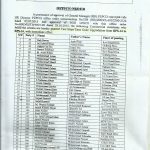 Ppsc only grants age relaxation in PMS exam to FG employees. Dear GULENOSHAD there are chances for the upgradation in the budget. summary of assistant was approved by pm but stolen by finance minister. He is rubbing the signatures. Just on lighter side. Keep tight your shuolders. Respected sir, have u any news about the gradation of Assistant BPS 14 to 16? Dear abdul salam shahid as soon as i get the updates I ll share. Salam I am Assistant reinstated in Establishment Division in Feb.2011. My appointment was on 1989 in peoples program and it is 2nd time I reinstated.Can you please guide me what benefits will be given to me on retirement.Is any up date of up gradation of Assistant notification. Dear Nawab Ali mujhay confirm nahin hay. Dear Madam recently i m selected as Sub-Accountant (BPS 14) in Finance Dept KPK. Now Please Let me know how much time it will take to promote BPS 16 and to which scale Sub-Accountants are upgraded. Please also tell me about the starting salary of this post. Dear Mohammad Shafiq your starting salary will be about 20,000/-. I m not confirm when you will be promoted. Aoa madam.hope u r fine nd excellent.mam any hope for the upgradation of BPS 12 data entry operator. Mam i need your email adress for some detail about my post. Thanks Madam for useful information. I shall be grateful for your valuable input if you can provide details of allownces admissable to lecturer BS-17 including adhocs separately for the purpos of comparison with existing allowances. Dear Jabir plz email me I ll send you the detail. AoA. Dear madam have u any latest news about the up-gradation of Assistant? Madam please guide me about starting salary of lecturer BS-17 in punjab including all allowances. Adhocs will be admissible? Is there any option of hired accommodation option like fedral employee? I am federal Govt employee Bs-16 (8 years service). Intended to compete lecturer jobs recently announced by PPSC. Dear Jabir it is estimated 39000/- Adhoc Allowances are admissible. You are not entitled for hiring. Please let me know the prescribed time for submission of retirement TA in Federal Government. Dear RAFIQUE AHMED KHA plz email me all the details. Dear Yargul for the Punjab is expected next week. Dear ShumailaKamal, I have no updates about the up-gradation of Assistant. As soon as I know that, I shall share the same with you. Hope for the best . Plz don't try this at home , school or any where else. Be safe. up-gradation of Assistant from BS-14 to BS-16. The summary is prepared by Establishment Division and hopefully will be approved by the Prime Minister in this week. one time grant to all Assistant BS-16. Initial BS-15 will be given to Assistant. In future 3 years satisfactory service as Assistant in BS-15 will be given BS-16. Dear fellows any update regarding assistant? And dear aik info din jo recently assistant hn jinki service 3 sal se kam ha unhn 15 scale mily ga ya 16? Dear Naveed abhi koi condition nahin hay. Let's w8 for the Notification. Mam, rumors are pouring in frequently that establishment divn. has approved the proposal for upgradation of federal govt. clerical staff on 24/27-04-2015. Assistants will be upgraded to BPS-15, UDC to BPS-11 and LDC to BPS-09. And it is being hoped that final notification would be issued by Finance Division within current week. Is there any confirmation from any source? Dear Qaisar Shakeel main nain yeh rumour nahin suni. As soon as i get the confirm updates I ll share. Dear sister r u have any updates about the upgradation of clerical staff because the punjab govt also ordered that the summary will be submitted in the cm office information within ten days. Dear Mudassar still no updates. Just w8 for the June. Is there any possibility for senior assistant post?or the matter left abeyance looking for kind reply''. Dear Tasneem still no updates. Dear Nawaz still no updates. As soon as i get the updates I ll share. Dear Fazal it is the duty of the APCA leaders to notice this discrimination and raise voice. aoa madam. the balochistan govt has upgraded the post assistant from b14 to b16 for secretariat and some other department but for attached departments the post of assistant is upgraded to b-14 to b15. dear madam how in one province two notifications issued. so you people are working on this serious issue or this disparity of rights prevails. Dear Fazal you can appeal for the BPS-16 alongwith the copy of the Secretariat Notification. dear madam any news upgradation of assistant time frame of FST has been completed. Dear Muhammad Farooq still no updates have been received. Dear yargul as soon as i get the updates I ll share the same. Dear Nadeem still no updates of the Notification. Aoa mam ktny % chance hn k notification ajaye ga humain to nai lgta k nawaz govt aisa hny de g aur is k ilawa suna ha is dafa b ye 10% hi pay increase kr rahy hn kindly tell me about that. Furthermore do u have any news about da upgradation of pay scales this year? Dear Nadeem there are much chances for the pay scales revision this year. mam the last date of 12th April, 2015 to implementation the decision of the upgradation for the post of assistant is expire now, any news regarding implementation of the decision of Fst by the Establishment Division as well as finance Division, please. Dear Amjad hope for the best in the coming budget. AoA. 2 months deadline will be completing on 12Apr Sunday. Hopefully notification will be issued on 13 April, Monday, Insha Allah.... Amen. Dear Yargul just w8 a few days more. Dear rabia sabir still no news as soon as i get the updates I ll share the same at this website. A-o-A kia koee achi khabar ha ya abhi tak Hakoomat khamosh ha ? Dear Muhammad Hafeez, it sounds no good news for the employees. Dear Rabia back date say bhi ho sakta hay aour with immediate effect bhi. It depends on the Govt intention. Ma'am I want to appreciate you for your valueable work and hope the same spirit in future. Thanks Dear Malik Nadeem for appreciating mine efforts. I ll share the updates in this regard soon. Upgradation of Assistant to BS-16 will be made from the date of Judgement given by FST, from the date when first judgment was given or immediate effect? Dear Shabbir let's wait the Notification and its detail. Thanx for ur valuable guidance. will u be kind enough to provide a copy of notification blocking the back dated promotion issued, in 2003(perhaps). May we challenge this amendment, which is against the right of civil servants because it stopped/delayed the timely consideration for promotion.Further, if any instruction / notification for immediate consideration of next incumbent for promotion, exist, please email. Dear Shabbir Ahmed meray pas is letter ki copy nahin hay. such like letter or direction (timely holding of DPC)? Dear Sattar mujhay is ka confirm nahin hay. i win my promotion case from labor court but management is not implementation.further court fixed contempt on management.but now management is using delay tactice. please give advise me. Mam any update regarding up-gradation of LDC, UDC & Assistant? Dear Rao as soon as i get the updates I ll share. Dear Imtiaz khan I have no updates about it. Ms. Shumaila! your efforts are praiseworthy. Congratulations to Assistants and salute to the leaders of the movement. Dear Abid Hussain Soomro thanks for appreciating mine efforts. thanks mam, please updated the matter. Kya sindh govt. ka ap bata skate ho kab tak upgrade honey assistant bps 14 to 16. Dear Kanwar no exact date can be predicted. Dear Shumaila Kamal kia FST kee decision Assistant kae favour main hae yaa nahin, agar hae to notifcation kb niklagaa. Dear Abdul Waheed jamali decision to Assistants kay favour main hay. Hope for the best. Dear Khalid plz email me all these details alongwith ur total service, total age and BPS. Dear ABDUL RAOOF KHURAM "FST nain kaha hay 2 maheenoon main Notification nikalo." Dear Khalid ur pay will be fixed as Rs. 26000/-. The new allowances depends on ur previous allowances. For pension plz email me ur total service, age, basic pay department etc. mam, there was a case in FST about upgradation of clerical staff i.e UDC, LDC etc which was reserved for decision... Do u have any informaton? Dear Iqbal still the decision has not been out.